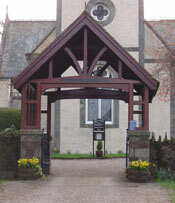 There was a church first built at Kenmore in 1579, replacing the pre-Reformation church at Inchadney, though the Inchadney church, burial ground and manse were still used until 1760 when the burial ground was closed, and a new Manse was built on the glebe, across the loch from the church. The stone font, still in use in the present church, was found at Inchadney, the one remaining link with the pre-Reformation church. Much of what can be seen of the building at present dates to about 1760, when the 3rd Earl of Breadalbane built a model village at Kenmore, and reconstructed the church, adding the transepts and the tower, and laying out the churchyard and the church green. The Poor Box predates the reconstruction. The Church collections and fines went into this iron bound chest, and sums of money were given, or lent if there was a prospect of repayment, to those in need. The box itself was stolen, along with the baptismal bowl, during the Civil War in 1645, but was later returned, though the baptismal font was never recovered. The church was further renovated in 1871, and in 1924, when the congregations of the Free and Established Churches were in the process of uniting, both congregations were involved in again renovating the church and rebuilding the chancel. 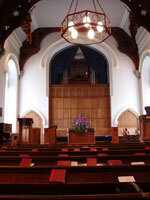 The organ was moved to its present position in what had been Lady Breadalbane’s gallery, and the light oak furnishing installed. 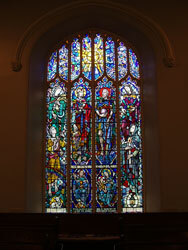 In the transept there is a window dedicated to the memory of John MacNaughton LLD and his son, Ian Robert Reekie MacNaughton, designed by Abbey Studios. 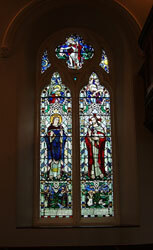 In the South transept is a window by Mr W. Wilson RSA in memory of Mr and Mrs J K Hutchison of Bolfracks. The theme is Praise to the Creator: the two main figures are King David the psalmist and John the Baptist. The side panels represent the four seasons of the year, with the corn in the summer and fruit in autumn symbolising the bread and wine of the Sacrament. 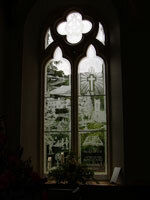 The central light, designed by Lavinia Grant, reflects various Christian symbols found in the church - e.g. a cross, a lamb, a crown of thorns, and a sun. To celebrate the 400th anniversary of the church in Kenmore, various members of the church and their friends embroidered pew cushions for all the pews in the church. The designs are all based on Celtic patterns from the Book of Kells. 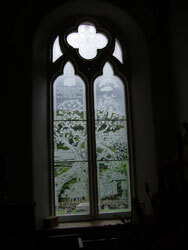 More recently, two etched glass windows, designed by Anita Pate, have been installed. The first, on the north side, celebrates the 40 year ministry of Rev Kenneth MacVicar from 1950 to 1990, and features, among others, the bible, the church, the old Manse and family life. The second, on the South side of the chancel, is in memory of I A Duncan Millar of Remony, for many years an elder of the church, and reflects much of rural life - a shepherd clipping sheep, wild animals and flowers, dry stane dykes and salmon ladders. 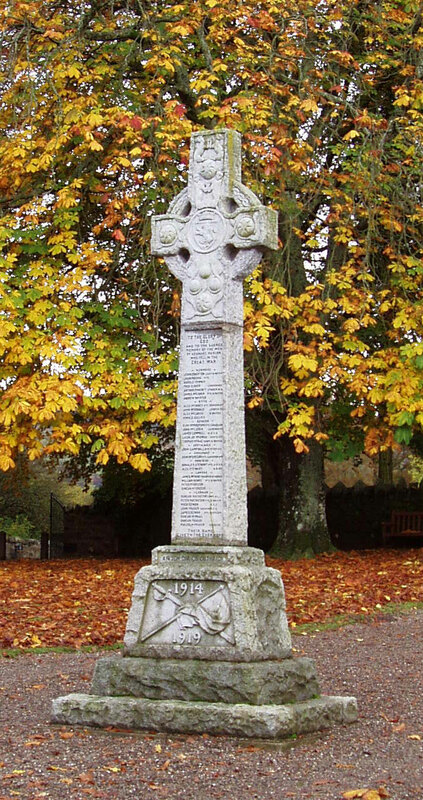 At the entrance to the churchyard is a lych gate, erected in 1901 in memory of Queen Victoria, who had died the previous year, and in the green in front of the church is the War Memorial in the shape of a Celtic cross.